There are two major types of income: linear income and residual-income. Linear Income is what you get as an employee. You make so much per hour and if you don’t work you don’t get paid. If you’ve got a really good job you will probably get paid by the week or by the month. Maybe you’ll even make good money. But if you get sick and can’t work your employer is going to get rid of you. The same thing is true for people working wholly or partly on commission, or tips for that matter. Maybe you’ve got a FANTASTIC job with excellent benefits and you can get sick and go on Long Term Disability (LTD). But even here you had better read the fine print. In some cases your LTD will not last forever. In almost all cases your LTD income will be at least 20% less than your regular income. In the case of all linear income, unless you have a really good defined benefits pension plan (the gold-plated pension where you know your benefits ahead of time), or the weaker defined contributions plan, your linear income will end. What will you do then? Work until you die? Even with a pension can you maintain your lifestyle? Or will you be in trouble? Residual Income is income that keeps flowing even after you stop working. For example, while you are writing a book you will earn very little, perhaps no income. But if the book becomes a best seller you could receive royalties for years and years. Another example is in the field of music, writing, producing and performing. No earnings up front but big potential later. Good residual income is when you leverage a relatively small proportion of your “life time” into long-term income. This is residual income. Robert Kiyosaki, the world famous author of Rich Dad, Poor Dad, wrote a second book CashFlow Quadrant, Rich Dad’s Guide to Financial Freedom. You can see that the Employee (E) Quadrant is the major source of linear income, where most people are. The typical wage earner on linear income will never get ahead financially, even if they make a good wage. Is the middle class better off in North America than 20 years ago. No, and it is sinking even lower. After all JOB is an acronym for Just Over Broke. •	Lots of government forms to complete: WCB, sales taxes, income tax, grants etc. •	Sale of the company, or of major blocks of stocks, will allow them to move into the Investment (I) quadrant. 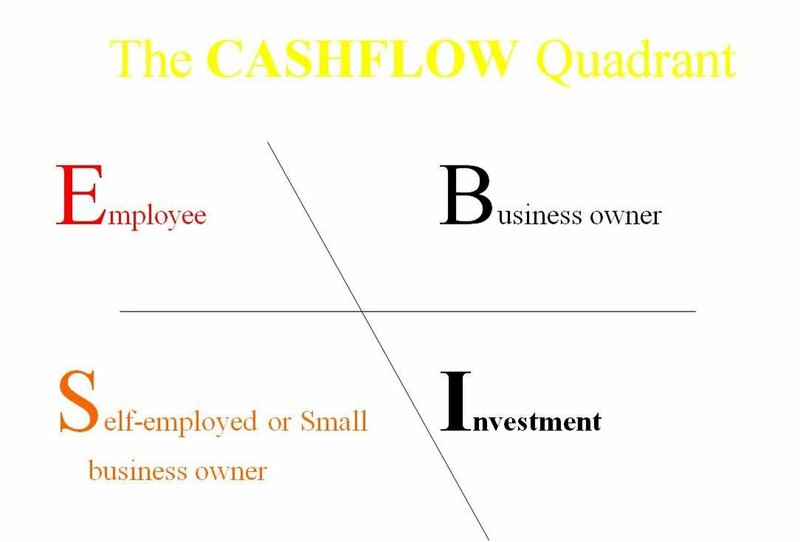 The Investment (I) Quadrant is where some people go for residual income. If you are in a pension plan your contributions and those of your employer are invested in various instruments to earn enough income so that the plan can pay its retired employees. Registered Retirement Saving Plans (RRSP) is a very good form of investment for the average person because they receive tax benefits by creating one. But in both cases we’re talking about relatively small levels of residual income. Remember the 40/40 Rule. Very Successful Investors (a small percentage of all investors) are generating high level residual income. They put some of their money (or their company’s money) into play so that other people do the work and they make the profit. This is very sophisticated and risky and it’s not for the average person. There is another source of Residual Income that is open to the average person. It does require hard work upfront but the potential for serious residual income is significant. Click here for a residual income option (opens in new window) and then click on "Opportunity". For more information on ways to get Robert Kiyosaski’s excellent book click here (opens in new window). To return to Active Boomers click here.